Apr 22, 2010 — BANGALORE, INDIA (PRLOG) — The Indian Institute of Technology, Bombay, on its Foundation day, bestowed the Distinguished Alumnus Award 2010 to Sriman Madhu Pandit Dasa (a.k.a Madhusudan Sivasankar), Founder Chairman, the Akshaya Patra Foundation and President of ISKCON – Bangalore. The institute recognised and honoured Sri Madhu Pandit Dasa for "his contribution to humanitarian services and organic farming", said the citation. This is the highest honour the Institute bestows on the Foundation Day. The institute honours five alumni every year and the others who received the Distinguished Alumnus awards this year along with Madhu Pandit Das are Dr Nitish Thakor, Professor, John Hopkins University, R.Chandra Shekhar, IAS, Secretary, Department of Information Technology, Government of India, Adil Zaimulbhai, Managing Director, Mckinsey India and Colin H Gonslaves, Founder, India Centre for Human Rights and Law. As a pre-degree student, he was selected by the highly reputed National Talent Search program of the country. He completed his B.Tech in Civil Engineering from IIT-Mumbai in the year 1981. Having found the path that answered his quest for the Absolute Truth, right after his days in IIT-Bombay, Madhu Pandit Dasa dedicated his life to serving the mission of His Divine Grace A. C. Bhaktivedanta Swami Prabhupada. He has nearly three decades of self less work behind him. He has demonstrated ability in building organizations of excellence in the non-profit sector and is held in high esteem for his contribution to the society, in humanitarian, cultural and spiritual spheres. He has been instrumental in conceiving and implementing many social initiatives that have, are and will change the lives of million of people in this country. Besides impacting the social sector, his innovative presentation of utilizing the mesmerizing technological medium has rekindled and re-energized the interests in our rich Indian culture. He designed and built one of the most popular cultural centers, ISKCON Sri Radha Krishna temple in Bangalore, which was inaugurated in 1997 by the then President of India. The successful completion of this project was nothing but the result of applying his training in IIT on a foundation of spiritual maturity for a selfless cause. Sri. 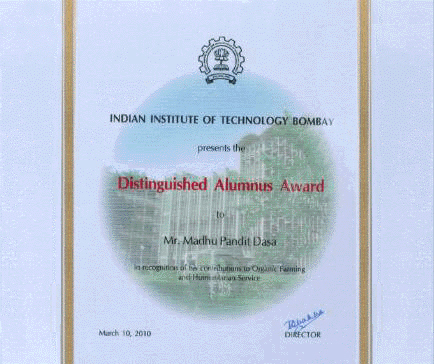 Madhu Pandit Dasa said, "I am very humbled and honored on being conferred the Distinguished Alumnus Award on the 51st Foundation Day of IIT Mumbai. This recognition is considered by me to be the blessings my worshippable Lord Sri Krishna and the blessings of the millions of children we feed in Akshaya Patra."